Eastern Washington's voters likely are more divided than they've been in nearly a quarter century on which party's candidate they prefer to represent them in Congress. Local respondents to a poll sponsored by The Spokesman-Review and other Inland Northwest media hinting at a close November race showed deep political divisions when interviewed after the statisticians wrapped up their calculations. Much of the schism is driven by perceptions of President Donald Trump. 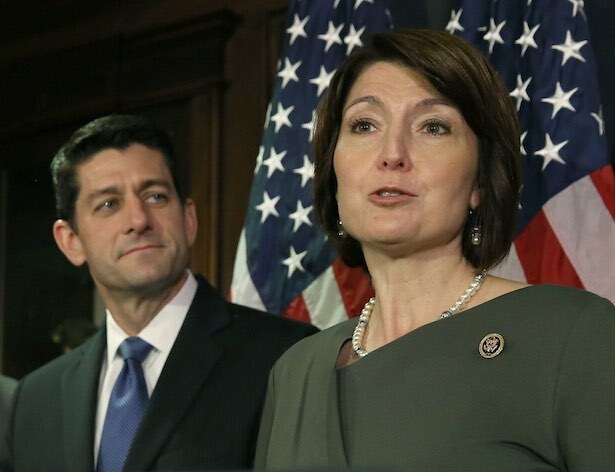 McMorris Rodgers' supporters mostly lauded the president's aims and accomplishments, while those backing Brown criticized the head of the Republican Party and the congresswoman's apparent unwillingness to stand up to him. "I have voted for (McMorris Rodgers), up until this year," said Janice Loft, a 75-year-old retiree who identified to pollsters as a Democrat. "She kind of got on my nerves this year, going along with Trump on everything." Spokane Valley's Donna Stemple, 76, said she'd be voting for McMorris Rodgers because of the values the congresswoman represents, particularly her opposition to abortion. She attributed the Democratic enthusiasm in the district to what she sees as directionless disturbances following the outcome of the 2016 presidential election. "I think they would be enthusiastic for Donald Duck," Stemple said. "I truly believe that the Democrats would go for anybody that had any kind of a chance." Jack Fay, a 21-year-old who'll be voting absentee in this November's election from his U.S. Navy post in the Pacific Ocean, said his ballot will read Brown, even though he hadn't heard of the former state senator and chancellor of Washington State University Spokane's candidacy until contacted by a pollster last week. "I'm not a fan of Cathy," Fay said, citing her support for new Federal Communication Commission rules that some say will endanger affordable access to broadband internet service. Since House Speaker Tom Foley, a Democrat, lost his re-election bid in 1994, the seat in Congress representing Eastern Washington has been won by Republicans by at least 10 percentage points. Here's how other respondents to last week's poll expressed their views on McMorris Rodgers, Brown and Trump. The country and Congress, haven't given President Donald Trump enough of a chance to pursue his agenda, Becky Bublitz said. "Anymore, I'm just tired of the parties," said Bublitz, who identified as independent but said she's never voted for a Democrat. Bublitz strongly approves of the job the president is doing but admits her first choice was Marco Rubio, the Florida senator who sought the Republican nomination before bowing out during Trump's rise to the top of the ticket. "I didn't actually vote for Trump," Bublitz said. "But I just say, let the man do his job." She praised McMorris Rodgers, saying she presented the correct image for the district. "She is a great mother and has been married for a long time," Bublitz said. "She has the values we need, and I think she would spread those out to the people that need them the most." Like McMorris Rodgers, Bublitz said she doesn't agree with all of the president's policies. She said Trump didn't appear to understand what it's like to be poor in America and called his idea to replace food stamps with a meal delivery service "stupid." But she believes Republicans should be given the opportunity to pursue the policies that would assist impoverished Americans. "Trump has a very strong personality, No. 1. McMorris Rodgers probably does, too, as far as I know," she said. "You can't agree on everything." Alice Beattie remembers when you could call Tom Foley's office and get an immediate answer. Foley, a Democrat, represented Spokane in Congress for 30 years until his 1994 loss. Times have changed, she said. "If you called up Cathy McMorris Rodgers right now, all you'd get is an answering machine," Beattie said. The longtime Spokane Valley resident voted Republican up until the Ronald Reagan years of the early 1980s, she said. Her husband worked for the railroads, and the household suffered when Reagan chose to slash pensions in 1983, shifting the Beattie household to the Democratic column, she said. That now includes Brown, who Beattie said had a better grasp on issues important to Eastern Washington voters than McMorris Rodgers and should be given a chance, given what she saw as the congresswoman's lack of focus on the district. Beattie is part of an age cohort that shows a toss-up between the two candidates for Eastern Washington's seat. Among voters age 65 and older, voters were split nearly down the middle between McMorris Rodgers and Brown at 43 percent and 42 percent, respectively, with 15 percent of voters in that group undecided. Beattie, who supported Hillary Clinton in the 2016 presidential election, also said the McMorris Rodgers needed to stand up more to Trump and the policies she disagrees with. "She needs to get a backbone," Beattie said. "I'm sorry, but are you a real person or just a party facade?" Gabe Hinkle's been voting Republican since moving to Eastern Washington from Montana in 2000. "I think the Democratic Party doesn't have any ideals that I pretty much align myself with," said Hinkle, who gave both Trump and the congresswoman high marks, hewing closely to poll results that showed McMorris Rodgers with majority support among male voters in a head-to-head race with Brown. Hinkle praised McMorris Rodgers for her work with veterans and with protecting the rights of gun owners. He said the belief by Democrats that Brown can topple the congresswoman in a largely conservative district amounts to "a pipe dream" and that Brown is a "classic liberal." "Democrats and the media, the establishment in this country always forget about Middle America," Hinkle said. "I think they're out of touch, really, with what's going on." McMorris Rodgers failed to reach a majority of total likely voters in a head-to-head matchup with Brown in the poll. But she did get a majority of the male respondents, including Hinkle, and had her strongest showing among respondents between the ages of 36 and 64. Hinkle said he strongly approved of jobs McMorris Rodgers and Trump are doing in Washington, D.C., and he isn't concerned about any disputes between the two over tariffs and other issues. "I think that's good that there's a little bit of disagreement with them," Hinkle said. "When everybody just does what everybody else is doing, I don't think that's good for the country." Cheney resident Richard Wheeler grew up voting Republican, but like fellow Brown supporter Beattie, opted out of the GOP with the Reagan presidency. "It was trickle-down economics," said Wheeler, who strongly disapproves of the job Trump is doing in the White House. "The trickle-down thing that they're trying to do with the current tax plan, nobody believes that to be true." Wheeler, who moved back to the Spokane area three years ago after working for several years as a middle school teacher in the Puget Sound, said he hadn't heard much about Brown other than what's been reported since she announced her candidacy in August. He's picked her over McMorris Rodgers, like many of the Democrats in the district, because of his concern about who's in the White House. "I'm really concerned about his erratic behavior," Wheeler said of Trump. "I don't believe he has a specific agenda." Respondents older than 65 were much more likely than those between the ages of 36 and 64 to disapprove of the job McMorris Rodgers is doing on Capitol Hill. Wheeler, who lived in Spokane during the days of Foley's speaker tenure and watched from afar as he was ousted by voters in 1994, said Brown gives the congresswoman reason to worry. "I think she has a shot at it," Wheeler said. "I think Trump is really a polarizing figure."